Created by Jim Lee (artist) and Brandon Choi (writer), the team first appeared in 1992, in the first issue of their eponymous comic book WildC.A.T.s: Covert Action Teams, published by Image Comics. It was Image founding partner Jim Lee's first work published by the newly launched company, and his first creator owned project. WildC.A.T.s were the starting point for Lee's menagerie of interconnected superhero creations, which became the foundation of the Wildstorm Universe. The first series (Vol. 1) ran for 50 issues plus a #0 (cover dated June, 1993), from 1992 to 1998. In 1998, ownership of the WildC.A.T.s. concepts and characters were sold to DC Comics, as part of DC's acquisition of Lee's company WildStorm Productions. A new incarnation of the team was soon launched under the simplified title Wildcats (Vol. 2, 1999) and ran for 28 issues. Vol. 4: Battery Park (#20-28). The third series, Wildcats Version 3.0 (Vol. 3, 2002), revolved around the HALO Corporation, its CEO Jack Marlowe, Grifter and a gallery of new characters subverting corporation politics to their cause of creating a better world. This incarnation lasted 24 issues and was followed by a nine-issue limited series titled Wildcats: Nemesis (2005), which returned to a more superheroic style reminiscent of the first series. 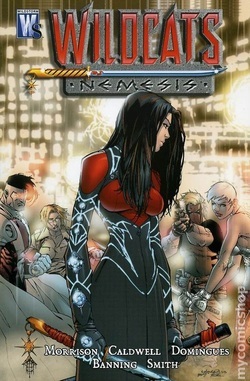 Wildcats: Nemesis (Collects the nine-issue mini-series). There are also the trades Brand Building and Full Disclosure, the former collecting the first six issues and the latter one collecting issues #7-12, but these were made obsolete with Year One and Two. In late 2006, a fourth ongoing series (Vol. 4) was launched as a part of the WorldStorm publishing initiative. The series saw the return of Jim Lee as regular penciller for the first time since its first volume while Grant Morrison took over writing duties. Only one issue (!) was ever published, with future issues placed on hold. In mid-2008, a fifth volume of Wildcats was launched, running for 30 issues until it was cancelled in December 2010). The final issue (#30) was published in January 2011.